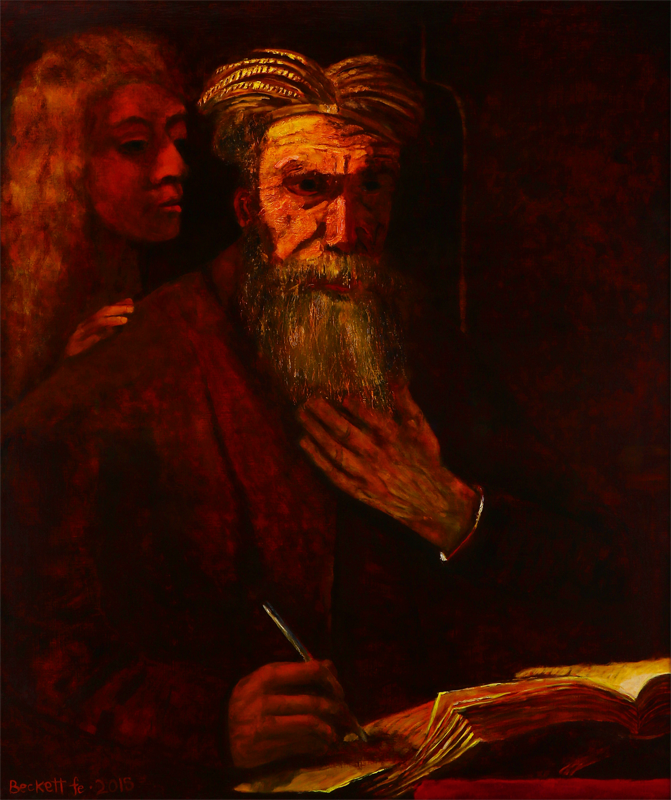 I studied Rembrandt's techniques and built the supports for this painting with heavy frames, Belgian linen, four coats of rabbit hide glue, an oil based primer of medium, chalk and marble, then a translucent glaze of Red Iron Oxide, followed with a translucent glaze of Yellow Ochre. At this point my friend Martin said, "Do no more. Take this to the museum of modern art and have them sell it for 2 million dollars!" The prepared ground was beautiful. I transferred the reference using the square method having chalked out 4 inch squares on the larger canvas. I began by glazing in the darker areas in umbers and other earth colors, then worked in the impasto highlights. Meddling with them as they dried then glazing and wiping away the glaze as Rembrandt did. This painting was a joy to make. I learned much, and really enjoyed recognizing and understanding the elements in the composition that tell the story.